It tastes like coffee, but it isn’t coffee! What is it? It’s Barley Tea! Say goodbye to your coffee cravings and start a new healthy life with this wonderful nutty beverage. Barley herbal tea is made from a cereal grain that comes from the annual grass hordeum vulgare. It is a widely adaptable crop with a short growing season and you can find it in the wild, growing under various conditions. Barley was first domesticated in the Near East and it was eaten by the Romans as a staple, until it was replaced by wheat. In Medieval Europe, barley bread was actually food for peasants, later replaced by the potato in the 19th century. This cereal has been present in Chinese medicine over a long period of time for its properties and amazing health benefits. Nowadays, Barley tea is known around the world, so don’t be surprised if you find it going by different names when you travel to Asia. In Japan, it is called mugicha, in China, dàmàichá and, in Korea, boricha. Mugicha has been known in Japan for hundreds of years and it is considered a great cooling summer drink. Today, you can even buy it in vending machines. In Korea, it is served year-round: hot in the winter and cool in the summer to please your senses. If you happen to be in Britain, you may find a similar beverage called barley water. It is made from boiled, not roasted barley and it is usually flavoured with lemon, which results in a lemonade-like drink. This cereal grain can delight your taste buds and satisfy your coffee craving, but it also has many other uses. It is a food crop and a staple grain in North Africa, Middle East and Asia. It is also used as animal fodder, as the base for other distilled drinks, to flavor your soup, stews and to make bread. So the same cereal that makes beer, can also be used to make a wonderfully healthy tea. Let’s find out exactly what health benefits of tea, barley has to offer you. Barley herbal tea and grass of Barley work as a great nutritional supplement, so this tea is the perfect beverage to give you strength and keep you healthy! It contains 8 essential amino acids and it is rich in vitamins, fiber and minerals. It also offers you glutamic acid, which is rich in antioxidants. How can so much richness help you? Whole grain barley can regulate and reduce the level of sugar in your blood. If you are worried about your heart, have a cup of barley tea. This cleansing tea may increase blood fluidity, lower cholesterol and, according to the Japanese, mugicha rids the blood of impurities. This nutritional tea can be brewed as a caffeine free coffee substitute, which is the reason why so many Americans love it. It offers a pleasant roastiness, similar to coffee. Drinking this tea on a regular basis may help you to cope with stress and reduce physical problems that are associated with it, like gaining weight by overeating during stressful periods. Do you often feel uncomfortable after heavy meals? Help is on the way! Barley herbal tea is a natural antiacid that improves your digestion and may also treat nausea. It’s a good solution for those who wish to lose weight, as it is a healthy alternative to sugary drinks and it gives you a sense of fullness. Being hydrated is a great way to prevent constipation, so choose barley tea. It helps to improve bowel movement and keeps you refreshed in the summer. Whenever you sense the first cold symptoms knocking at your door, prepare yourself a cup of hot Barley tea. It is a great treatment for fever and it cleanses the system. Barley will break up congestions and phlegm; help with bronchitis and also asthma. This cereal grain will help you breathe well again. If you have a sore throat drink 2 cups of tea per day to help you get better. This tea cools down the body and cleanses the system, ridding your body of toxins. Barley tea is recommended as a diuretic, reestablishing proper urine flow, it may also reduce pain and unpleasant odors. It may protect you against some forms of cancer, and it is said to help reduce toxicity and side effects of radiation and chemotherapy. This tea may help with night sweats if you have reached menopause. A barley infusion is also an excellent tea to restore your smile. It promotes oral health by inhibiting the growth of disease and germs. It can be used as a treatment for hemorrhoids and inflammatory arthritis. If you wish to ward of those unpleasant wrinkles, Barley water might be a solution. It is believed from ancient times to be good for fair skin and to prevent aging signs. To sum it all up, Barley tea is a great source of phytonutrients and antioxidants that protect the body from the damage caused by free radicals. This tea is also a delicious and nutritious alternative to green, black and herbal teas with and between meals. Purchase your herbal tea today! Even though tea made with roasted barley is so great, if you are pregnant or breastfeeding, you should avoid it, as it may stop lactation. This tea is made with a cereal that contains gluten, so if you are gluten intolerant you should avoid drinking it. It’s time to learn how to make Barley tea. Let’s put the kettle on. You can buy roasted barley at a local Asian market. Otherwise, when making this tea from scratch, you must roast barley in the oven or in a skillet, until as the grains become brown (traditionally, a deep dark brown). Later, you can easily grind roasted barley by using a pepper grinder. Watch out for the freshness of barley grain, as it can turn rancid if you leave an open bag too long in the pantry. Don’t be afraid to get creative as it goes well with all types of food! It takes more time to prepare it this way than using a regular tea bag, but tastes better and makes a fine iced tea when steeped for a few minutes. Simmering makes the most robust tasting and dark mugicha. To do this, bring water to boil, throw in 2-3 tablespoons of loose grain per liter of water or tea bag, then lower the heat and let simmer for a couple of minutes. Tip: make sure you use filtered water as it makes a difference in taste. Turn the heat off and let it cool in the pan to room temperature, then strain and, for iced tea, chill in the fridge. Adjust amount of barley seeds to the desired flavour. Mugicha often comes in tea bags as well as loose form. It usually involves roasted barley and a deeper, stronger flavour that may or may not be as enjoyable as unroasted barley. If you are planning on making a cold barley infusion, is not necessary to boil the water when using tea bags for a whole pitcher of water. You can brew it as sun tea. It can be enjoyed at any time of the day and it has a mellow, soothing and nutty taste that doesn’t require sweeteners or lemon, as these will alter the taste of it. You will experience a slight bitter undertone, but less that tea from the tea plant camellia sinensis. In Korea, they still use the traditional method: roasted barley seeds stewed in hot water. Koreans use roasted unhulled barley, often combined with oksusu cha (roasted corn infusion) so as to balance the bitterness of the barley with the sweetness of the corn. In Japan, they now normally use tea bags with grounded barley (easier for making a whole pitcher of cold tea) and also sell it in cans in vending machines. Mugicha is traditionally made by briefly simmering roasted barley grains and it has a toasty flavor. As for the resulting taste, in Korea, this tea is so intense that it resembles coffee, whereas in Japan it is more mildly brewed. Either way, it is a very interesting experience. It sounds interesting, doesn’t it? This tea offers you immense health benefits and you can still use it to flavor your dishes! Easy, tasty and healthy. Buy Your Barley Tea Today! Click on the image or on the link below to purchase from Starwest Botanicals your Organic Barley Grass Powder. 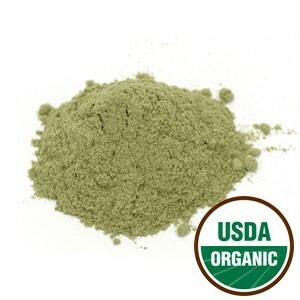 Make a healthy cup of barley tea using this great organic powder. Buy here your barley grass powder! In either powder or seed form, barley makes a wonderful tea with an original flavor. Drink it for the simple pleasure of a great beverage or for the benefits of tea. There’s no better time than now to find your right tea.